Update: Oct 2018 – After hearing numerous reports of customer complaints, lack of contact, and product quality issues, we can no longer support or condone anything to do with Neuroon any more. Sadly, we feel, they have let the sleep technology industry down. 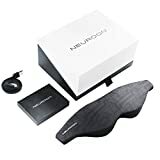 Looking like a sci-fi movie prop, Neuroon offers a bewildering array of features and specifications and is currently the only viable consumer product that lets you monitor your brain activity whilst asleep. What this means in practice is that once you’ve set the mask to sleep tracking mode, there’s very little communication between your phone and Neuroon. It achieves this by temporarily storing your sleep data in the mask’s onboard built-in memory chip. Then, in the morning, when you’ve woken up, your sleep data is synced by Bluetooth to the smart phone. This takes around 2 minutes so you have to wait until the transfer is completed before you can view your sleep data, or indeed use your phone.